An suicidal amnesiac(Zeljko Ivanek), with enormous telepathic power, is brought into a psychiatric hospital to determine what his identity is. The doctor over his care, Dr Gail Farmer(Kathryn Harrold) begins seeing her patient’s own nightmares, seeking to understand why he’s plagued by such horrific images that keep him from sleeping normally. Meanwhile, once an attempt at electroshock therapy yields a devastating link to the other patients in the hospital(..not to mention, the staff and security, often experience his nightmares as well), the efforts to heal “John Doe #83” are of a major concern of all involved. 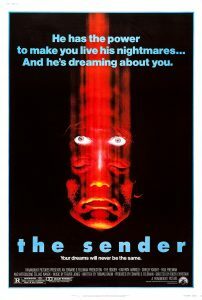 It’s determined that he is a “sender”, his abilities to transfer what he thinks and dreams to others heightened thanks in part to his perhaps deliberate amnesia due to a past traumatic event(s)which is better to forget than re-live. Farmer often receives communication from her patient’s mother, Jerolyn(Shirley Knight), by telephone and startling appearances..what makes these visits so strange is the fact that no one else sees her come or go through the hospital into her office. Soon Farmer is led to believe that Jerolyn may be the root cause of what is tormenting “John Doe #83” and she will have to fight for him for his very life might be at stake. One thing I stand amazed about in regards to the horror genre is the constant discovery of gems that you have never heard of until word of mouth leads you to them. THE SENDER is such an example. Through a few people on this site, I found out about the movie and I was pleasantly surprised to find it available on DVD. Everything about the movie is top-notch. The acting from a superb cast(..especially Harrold, a wonderful, underrated actress and the sterling Shirley Knight with the kind of character who’s really spooky), the ever-developing plot always unleashing startling scenes of shock and unpredictable images(..rats, roaches, blood dribbling from shattered mirrors, not to mention the show-stopping electro-shock sequence where the staff are “affected” by their attempt to “help” their patient, sent hurling through the air, crashing into equipment and through windows), really creepy score which hits all the appropriately effective notes, and the stunning cinematography from Roger Pratt(..who’s one of the best working today, notable for such films as TROY and a few of the HARRY POTTER movies). I think THE SENDER is such a success because it handles such a subject as dream transference and telepathy in a matter-of-fact, clinical way, trouble and care provided in developing the characters. In other hands, this could’ve been incredibly hokey and an object of ridicule. The professional look and feel of the film really sets this apart from other films of it’s type. Highly recommended to science fiction / horror fans, also of definite interest to the “asylum” genre crowd, I think. I’m a big fan of “telepath” horror themes, so THE SENDER did the trick nicely. One of character actor Zeljko Ivanek’s first big roles and he’s very effective in a haunting performance.